We’re back after taking a week off! How’s everybody doing? Well, I hope. There’s a lot of ground to cover so let’s just get to it. 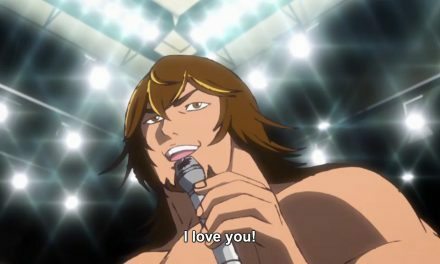 Don’t forget that you can watch every episode of Tiger Mask W over at Crunchyroll and if you want to find the rest of my recaps, you can do that here. 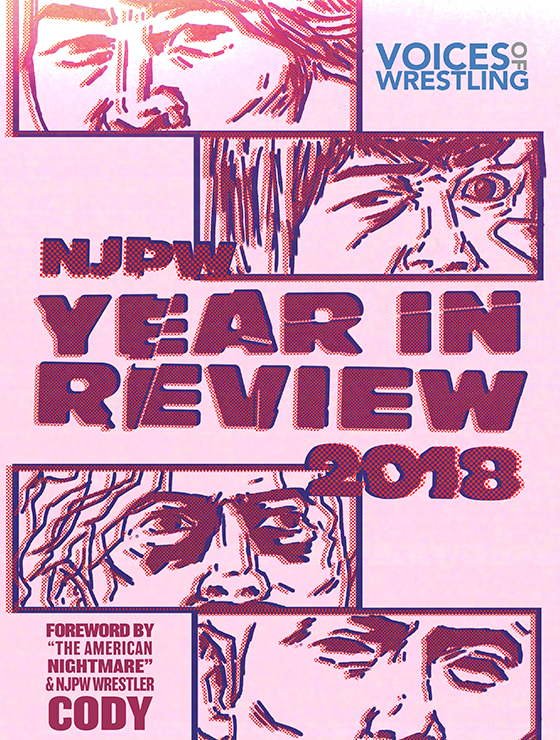 On January 4, New Japan had their biggest show of the year, Wrestle Kingdom 11. 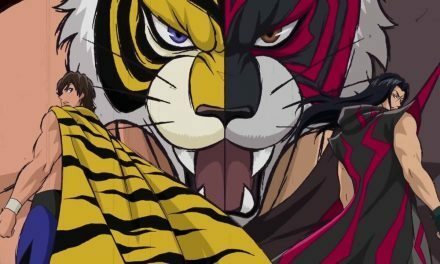 This year, the huge event was kicked off with a special match that brought the Tiger Mask anime to life when Tiger the Dark took on Tiger Mask. Tiger the Dark made his entrance first and man, he has ridiculously long hair in real life. When Tiger Mask made his entrance he was accompanied by his manager, Haruna. The voice actress of the character played the real life version too, which was a nice touch and allowed her to do the ring intro for Tiger. The match itself was perfectly fine. These guys weren’t out to have a five star classic, they were just there to promote the show. They stuck shockingly close to the match that these two had on the last episode of the show with Tiger the Dark’s Darkness Driver and Darkness Hold playing big roles in the match. About a minute or so into the match, Tiger the Dark hit a very impressive dive to the outside on Tiger Mask. A bit later, not wanting to be shown up, Tiger Mask hits a gorgeous springboard moonsault to the outside. This week we’re getting the finals to the Masked World League Tournament and the much anticipated showdown between Tiger Mask and Yellow Devil. The episode starts immediately after Tiger Mask’s match with Tiger the Dark, which makes this perfect to watch right after the match at Wrestle Kingdom. Tiger Mask heads to his dressing room, obviously exhausted after his match. 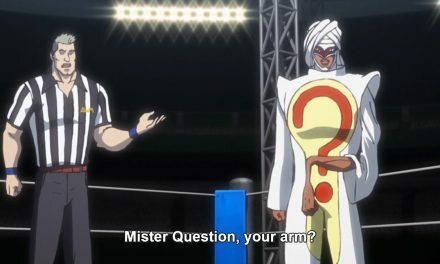 Ace wrestling journalist, Hikari Kuruma tries to ask him some questions, but he very bluntly tells her to come back later. This doesn’t seem to just be exhaustion, Naoto seems frustrated. 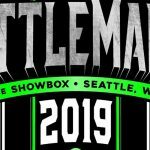 In the arena it’s announced that there’s going to be a special “diva’s match.” What comes from this diva’s match is a very interesting commentary on the WWE style of women’s wrestling from this series, which is essentially propaganda for New Japan (and Japanese wrestling as a whole). When we first see the women, the camera is focused primarily on their breasts. It’s hard to tell if this is how they feel that women are presented to fans in WWE or if it’s just a weird anime thing. I would have to guess that it’s a little of column A and a little of column B. In the backstage area the two women wrestlers are notified that their match time has been cut from 30 minutes to 10 minutes. While this doesn’t happen so much anymore, the women’s matches have often been victims of time cuts on big WWE shows in the past. Because the two women are straight up Charlotte and Becky Lynch. Back in Naoto’s dressing room, he’s visited by Haruna, Dragon Young (Ryu Wakamatsu), and It’s-The-Ace (Hiroshi Tanahashi (Go Ace!)). 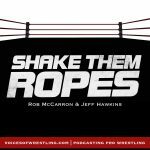 Tanahashi confirms what we saw earlier, Naoto isn’t just exhausted, he’s frustrated that he couldn’t get his killer move to work the way that he wanted it to. Tiger Mask nailed Tiger the Dark with a somersault knee, but that wasn’t what he had intended to do. His friends advise him not to worry about the move and to rest up during the diva match. Little does Naoto know that Miss X had the time cut by 20 minutes to give him less time to recuperate. We go to the ring where the two women, Queen Elizabeth (Charlotte) and Payne Fox (Becky), are being introduced. At the commentary desk, Fukuwara Mask tells his broadcasting partner to give him their stats, but instead he rattles off their measurements. This says a lot for how they think that WWE presents their women wrestlers. The match starts off with a test of strength, which Payne breaks with a kick to the stomach. She whips Queen into the corner and attempts a shoulder tackle. Queen avoids the move and pins Fox after a sunset flip. Payne kicks out at two as the commentator yells about how amazing the match is. Cut backstage to Miss X warning Yellow Devil to watch out for Tiger Mask’s somersault knee to the head. Yellow Devil tells her not to worry and then headbutts the wall so hard that he leaves a big hole in it. So much for having a nice backstage in GWM’s new venue. The match begins with a lock up. Yellow Devil effortlessly shoves Tiger Mask into the corner, getting into his head early on. They lock up again and this time Tiger takes Devil’s back and attempts to lift him up for a German suplex. Yellow Devil breaks Tiger Mask’s grip with an elbow and then catches Tiger with a Devil Tornado chop to the chest, sending Tiger flying back. Tiger Mask lunges at Devil and tries to lift him up for a tombstone and it’s clear that Naoto is starting to panic because nothing he tries is working. 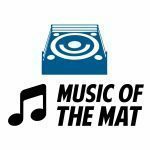 Yellow Devil takes Tiger’s legs out from under him and backdrops him to the mat. Tiger Mask rolls out of the ring to collect himself. In a fit of rage, he kicks the guard rail, leaving a section of it mangled. From the crowd, both Naoto’s past trainer, Daisuke Fujii, and current trainer, Kentaro Takaoka, yell at him to get his head on straight and to be his normal self instead of psyching himself out. After taking some deep breaths, Tiger Mask gets back into the ring with a newfound calm. Tiger nails Yellow Devil with a nasty spinkick to the head, his first successful attack of the match. Devil whips Tiger Mask into the ropes and hits him with a lariat on the rebound, but Tiger grabs his arm on the way down and locks in a cross armbreaker. Yellow Devil makes it to the ropes to break the hold. Devil returns to his feet, cracks his neck, and says “not bad.” The tide may have turned, but Yellow Devil isn’t backing down. Backstage, Takuma wakes up following his defeat by Tiger Mask. 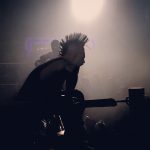 He staggers out of bed and into the arena to watch the match. Tiger the Dark slumps against a wall and looks to the ring to see Tiger Mask trapped in Yellow Devil’s Argentine Backbreaker. Naoto escapes the hold with a knee to the face and then rocks Devil with an elbow strike. Tiger Mask gets Devil in the corner and unleashes a pretty brutal barrage of kicks. Yellow Devil’s head whips around, taking kick after kick. The referee should seriously consider stopping the match at the point where Yellow Devil drops to his knees, seemingly knocked out. Devil flashes back to the day he was giver the mask and then fires up, launching himself like a bullet at Tiger Mask, taking the wind out of him with a headbutt to the stomach. Yellow Devil grabs Tiger Mask by the throat with both hands and lifts him into the air, putting the stress of all of Tiger’s body weight on his neck. This is all to set up for Devil crushing Tiger Mask’s skull with a headbutt. Tiger falls to the mat and blood immediately starts pouring out of his head. The crowd is hushed by Yellow Devil unleashing such a powerful move for the first time. Daisuke Fujii says that this can’t be the Yellow Devil that he once fought. Devil attempts the headbutt combo again, but this time Tiger Mask manages to block it with a kick to the chest. He follows up with a dropkick, knocking Yellow Devil into the corner. Naoto sees this as his chance and nails his killer move. He springs off of Devil’s chest for the backflip, hits him with a Meteora, and then transitions it into a Codebreaker. It’s an amazing sequence that I would love to see happen in real life, even though I know that it’s probably not possible. Not content with his victory, Tiger Mask lifts up Yellow Devil by his neck and removes his mask. 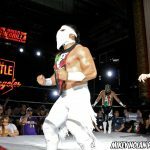 Everyone is shocked to find that the man under the mask is Billy the Kidman, a wrestler that we’ve previously seen working for GWM. This isn’t the man that crippled Daisuke Fujii all those years ago. After confirming that the man under the mask changed, Miss X attempts to hold the Masked World Tournament’s champion ceremony, but in a fit of rage Tiger Mask smashes the glass trophy he is given and storms out of the ring. 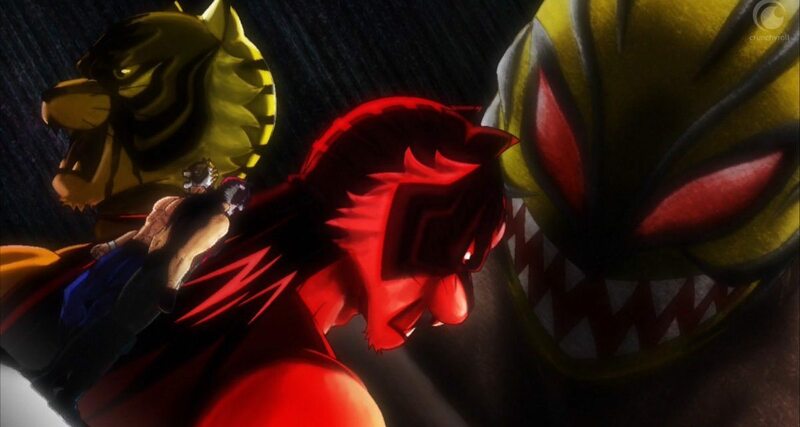 The episode ends with Tiger Mask and Tiger the Dark crossing paths as they both discover that the other is hunting down Yellow Devil. This Yellow Devil may have been beaten, but the original remains out there and both Tiger’s plan on getting their revenge. I have no problems saying that this was the best episode yet of the series. We got some fun WWE slander that was followed up with an awesome match. It seemed like they were going to burn their hottest story early in the series, but now with the original Yellow Devil missing, things have only gotten more interesting. Next week: We get the Naoto takes a date to a show he wrestles on episode that I wanted! This is gonna be great! 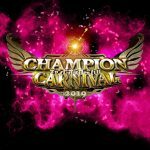 PreviousWho are the WWE UK Championship Tournament Participants?